Well, that was helpful. 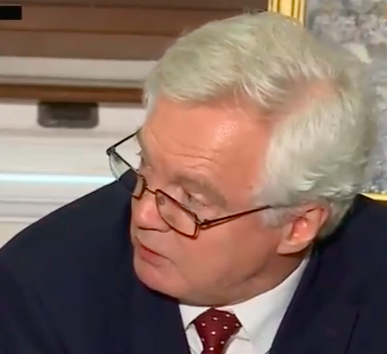 The European Research Group (ERG) made up of crazy Brexit Tories like Theresa Villiers and Owen Patterson came out with a paper yesterday that David Davis described as “fabulously practical”. Echoes of Donald Trump telling people he’s the best President of the US ever. As the crazies see it, the leader of their political party doesn’t know what she’s doing and what’s needed is a fabulously practical new plan for the border. How so? They’d check stuff AWAY from the border and they’d use TECHNOLOGY! Hold the headlines, break out the champagne – technology! Why didn’t we think of that before? And it’ll be technology away from the border, so the whole border thing is now solved. I expect Theresa May will be punching the wall that she didn’t think of that with her Chequers policy. AND did you notice what the ERG have said they will agree to on cross-border farming? Except my ears and eyes deceive me, they’re talking about keeping farming in the north in line with EU standards, so there’ll be no disruption to cross-border trading in agri-foods if their package is accepted. But alas for Jacob and the Crazies. The south of Ireland government and the EU have already seen through this daft document as picking and choosing, and have as good as told the Brexit crazies to take a walk and get some air. They take a similar line, incidentally, to Theresa May’s Chequers plan. With time running out and the British government, let alone the Rees-Mogg mob, marching in tight circles like an Orange band outside a chapel, I’m beginning to think that the insoluble problems like the border will be kicked down the road to the very edge of the Brexit cliff itself – next March. By then both sides will be suffering so severely from Brexit fatigue, it’s quite possible that some form of words that will leave the British border in Ireland as is, with the DUP being given some goodie in the form of a straight financial bribe, or maybe a form of words regarding trade with the south of Ireland that’ll serve as a fig-leaf and allow them to parade it as a marvellous victory wreath. Speaking of fig-leaves, I see where the Guardian today has compared the ERG’s proposals to the emperor with no clothes. So that’s why Nigel Dodds gave it the nod last night – trying to curry favour with Sammy Wilson.